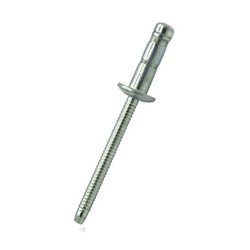 Pioneers in the industry, we offer nickel alloys closed end blind rivets, alloy steel grooved type blind rivets, alloy steel large flange multi grip rivets, alloy steel countersunk head rivets, alloy steel closed end blind rivets and stainless steel grooved type blind rivets from India. When it comes to Nickel Alloys Closed End Blind Rivets, there is no trusting name other than NeelKamal steels. Rivets also come under the fastening section and hence find its use in a variety of industries. It is also extensively used in the household. NeelKamal steels use steel for the production of Nickel Alloys Closed End Blind Rivets which are stainless.This helps in ensuring that the product is not rust prone which is known for eroding the product slowly. Our team of expert workers uses superior quality of raw materials for its manufacture only to ensure that it is long lasting and durable enough to live a lot of years.Before we validate our product, it undergoes a lot of tests to make sure that we provide only the best to our clients. Some of the tests are anti corrosion test and high tensile strength. With the anti corrosion test passed, our Nickel Alloys Closed End Blind Rivets are not affected by any weather conditions. When it comes to Alloy Steel Grooved Type Blind Rivets, there is no trusting name other than NeelKamal steels. 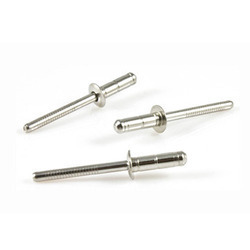 Rivets also come under the fastening section and hence find its use in a variety of industries. It is also extensively used in the household. NeelKamal steels use steel for the production of Alloy Steel Grooved Type Blind Rivets which are stainless.This helps in ensuring that the product is not rust prone which is known for eroding the product slowly. Our team of expert workers uses superior quality of raw materials for its manufacture only to ensure that it is long lasting and durable enough to live a lot of years.Before we validate our product, it undergoes a lot of tests to make sure that we provide only the best to our clients. Some of the tests are anti corrosion test and high tensile strength. With the anti corrosion test passed, our Alloy Steel Grooved Type Blind Rivets are not affected by any weather conditions. When it comes to Alloy Steel Large Flange Multi Grip Rivets, there is no trusting name other than NeelKamal steels. 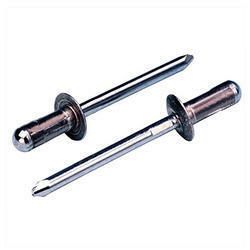 Rivets also come under the fastening section and hence find its use in a variety of industries. It is also extensively used in the household. NeelKamal steels use steel for the production of Alloy Steel Large Flange Multi Grip Rivets which are stainless.This helps in ensuring that the product is not rust prone which is known for eroding the product slowly. Our team of expert workers uses superior quality of raw materials for its manufacture only to ensure that it is long lasting and durable enough to live a lot of years.Before we validate our product, it undergoes a lot of tests to make sure that we provide only the best to our clients. Some of the tests are anti corrosion test and high tensile strength. With the anti corrosion test passed, our Alloy Steel Large Flange Multi Grip Rivets are not affected by any weather conditions. When it comes to Alloy Steel Countersunk Head Rivets, there is no trusting name other than NeelKamal steels. 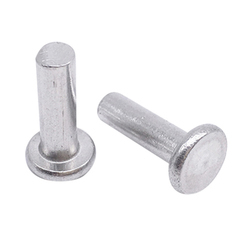 Rivets also come under the fastening section and hence find its use in a variety of industries. It is also extensively used in the household. NeelKamal steels use steel for the production of Alloy Steel Countersunk Head Rivets which are stainless.This helps in ensuring that the product is not rust prone which is known for eroding the product slowly. Our team of expert workers uses superior quality of raw materials for its manufacture only to ensure that it is long lasting and durable enough to live a lot of years.Before we validate our product, it undergoes a lot of tests to make sure that we provide only the best to our clients. Some of the tests are anti corrosion test and high tensile strength. With the anti corrosion test passed, our Alloy Steel Countersunk Head Rivets are not affected by any weather conditions. When it comes to Alloy Steel Closed End Blind Rivets, there is no trusting name other than NeelKamal steels. 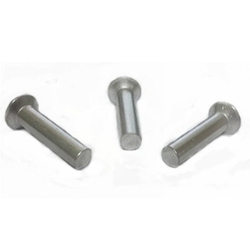 Rivets also come under the fastening section and hence find its use in a variety of industries. It is also extensively used in the household. NeelKamal steels use steel for the production of Alloy Steel Closed End Blind Rivets which are stainless.This helps in ensuring that the product is not rust prone which is known for eroding the product slowly. Our team of expert workers uses superior quality of raw materials for its manufacture only to ensure that it is long lasting and durable enough to live a lot of years.Before we validate our product, it undergoes a lot of tests to make sure that we provide only the best to our clients. Some of the tests are anti corrosion test and high tensile strength. 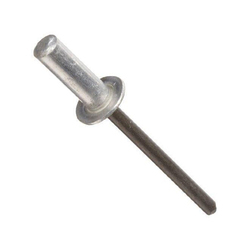 With the anti corrosion test passed, our Alloy Steel Closed End Blind Rivets are not affected by any weather conditions. When it comes to Stainless Steel Grooved Type Blind Rivets, there is no trusting name other than NeelKamal steels. 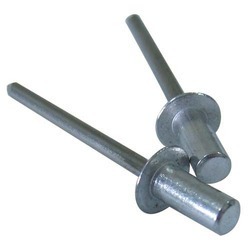 Rivets also come under the fastening section and hence find its use in a variety of industries. It is also extensively used in the household. NeelKamal steels use steel for the production of Stainless Steel Grooved Type Blind Rivets which are stainless.This helps in ensuring that the product is not rust prone which is known for eroding the product slowly. Our team of expert workers uses superior quality of raw materials for its manufacture only to ensure that it is long lasting and durable enough to live a lot of years.Before we validate our product, it undergoes a lot of tests to make sure that we provide only the best to our clients. Some of the tests are anti corrosion test and high tensile strength. With the anti corrosion test passed, our Stainless Steel Grooved Type Blind Rivets are not affected by any weather conditions. When it comes to Stainless Steel Countersunk Head Rivets, there is no trusting name other than NeelKamal steels. Rivets also come under the fastening section and hence find its use in a variety of industries. It is also extensively used in the household. NeelKamal steels use steel for the production of Stainless Steel Countersunk Head Rivets which are stainless.This helps in ensuring that the product is not rust prone which is known for eroding the product slowly. Our team of expert workers uses superior quality of raw materials for its manufacture only to ensure that it is long lasting and durable enough to live a lot of years.Before we validate our product, it undergoes a lot of tests to make sure that we provide only the best to our clients. Some of the tests are anti corrosion test and high tensile strength. With the anti corrosion test passed, our Stainless Steel Countersunk Head Rivets are not affected by any weather conditions. When it comes to Stainless Steel Large Flange Multi Grip Rivets, there is no trusting name other than NeelKamal steels. 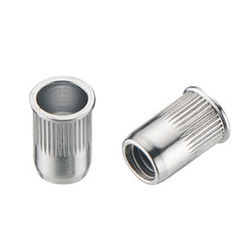 Rivets also come under the fastening section and hence find its use in a variety of industries. It is also extensively used in the household. NeelKamal steels use steel for the production of Stainless Steel Large Flange Multi Grip Rivets which are stainless.This helps in ensuring that the product is not rust prone which is known for eroding the product slowly. Our team of expert workers uses superior quality of raw materials for its manufacture only to ensure that it is long lasting and durable enough to live a lot of years.Before we validate our product, it undergoes a lot of tests to make sure that we provide only the best to our clients. Some of the tests are anti corrosion test and high tensile strength. With the anti corrosion test passed, our Stainless Steel Large Flange Multi Grip Rivets are not affected by any weather conditions. When it comes to Stainless Steel Closed End Blind Rivets, there is no trusting name other than NeelKamal steels. Rivets also come under the fastening section and hence find its use in a variety of industries. It is also extensively used in the household. NeelKamal steels use steel for the production of Stainless Steel Closed End Blind Rivets which are stainless.This helps in ensuring that the product is not rust prone which is known for eroding the product slowly. Our team of expert workers uses superior quality of raw materials for its manufacture only to ensure that it is long lasting and durable enough to live a lot of years.Before we validate our product, it undergoes a lot of tests to make sure that we provide only the best to our clients. Some of the tests are anti corrosion test and high tensile strength. 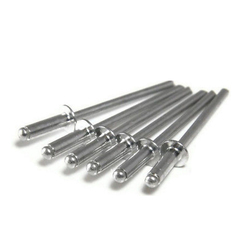 With the anti corrosion test passed, our Stainless Steel Closed End Blind Rivets are not affected by any weather conditions. When it comes to Nickel Alloys Grooved Type Blind Rivets, there is no trusting name other than NeelKamal steels. Rivets also come under the fastening section and hence find its use in a variety of industries. It is also extensively used in the household. NeelKamal steels use steel for the production of Nickel Alloys Grooved Type Blind Rivets which are stainless.This helps in ensuring that the product is not rust prone which is known for eroding the product slowly. Our team of expert workers uses superior quality of raw materials for its manufacture only to ensure that it is long lasting and durable enough to live a lot of years.Before we validate our product, it undergoes a lot of tests to make sure that we provide only the best to our clients. Some of the tests are anti corrosion test and high tensile strength. With the anti corrosion test passed, our Nickel Alloys Grooved Type Blind Rivets are not affected by any weather conditions. When it comes to Nickel Alloys Large Flange Multi Grip Rivets, there is no trusting name other than NeelKamal steels. Rivets also come under the fastening section and hence find its use in a variety of industries. It is also extensively used in the household. NeelKamal steels use steel for the production of Nickel Alloys Large Flange Multi Grip Rivets which are stainless.This helps in ensuring that the product is not rust prone which is known for eroding the product slowly. Our team of expert workers uses superior quality of raw materials for its manufacture only to ensure that it is long lasting and durable enough to live a lot of years.Before we validate our product, it undergoes a lot of tests to make sure that we provide only the best to our clients. Some of the tests are anti corrosion test and high tensile strength. With the anti corrosion test passed, our Nickel Alloys Large Flange Multi Grip Rivets are not affected by any weather conditions. When it comes to Nickel Alloys Countersunk Head Rivets, there is no trusting name other than NeelKamal steels. Rivets also come under the fastening section and hence find its use in a variety of industries. It is also extensively used in the household. NeelKamal steels use steel for the production of Nickel Alloys Countersunk Head Rivets which are stainless.This helps in ensuring that the product is not rust prone which is known for eroding the product slowly. Our team of expert workers uses superior quality of raw materials for its manufacture only to ensure that it is long lasting and durable enough to live a lot of years.Before we validate our product, it undergoes a lot of tests to make sure that we provide only the best to our clients. Some of the tests are anti corrosion test and high tensile strength. With the anti corrosion test passed, our Nickel Alloys Countersunk Head Rivets are not affected by any weather conditions. 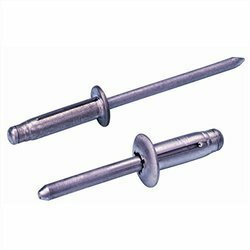 When it comes to Carbon Steel Grooved Type Blind Rivets, there is no trusting name other than NeelKamal steels. 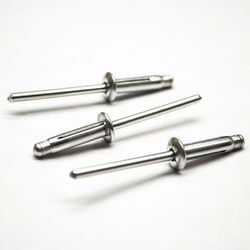 Rivets also come under the fastening section and hence find its use in a variety of industries. It is also extensively used in the household. NeelKamal steels use steel for the production of Carbon Steel Grooved Type Blind Rivets which are stainless.This helps in ensuring that the product is not rust prone which is known for eroding the product slowly. Our team of expert workers uses superior quality of raw materials for its manufacture only to ensure that it is long lasting and durable enough to live a lot of years.Before we validate our product, it undergoes a lot of tests to make sure that we provide only the best to our clients. Some of the tests are anti corrosion test and high tensile strength. With the anti corrosion test passed, our Carbon Steel Grooved Type Blind Rivets are not affected by any weather conditions. 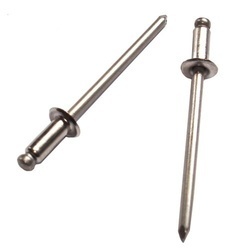 When it comes to Carbon Steel Closed End Blind Rivets, there is no trusting name other than NeelKamal steels. Rivets also come under the fastening section and hence find its use in a variety of industries. It is also extensively used in the household. NeelKamal steels use steel for the production of Carbon Steel Closed End Blind Rivets which are stainless.This helps in ensuring that the product is not rust prone which is known for eroding the product slowly. Our team of expert workers uses superior quality of raw materials for its manufacture only to ensure that it is long lasting and durable enough to live a lot of years.Before we validate our product, it undergoes a lot of tests to make sure that we provide only the best to our clients. 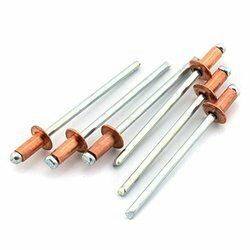 Some of the tests are anti corrosion test and high tensile strength. 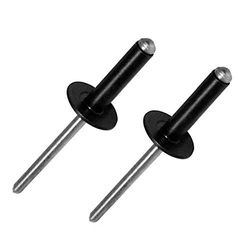 With the anti corrosion test passed, our Carbon Steel Closed End Blind Rivets are not affected by any weather conditions.